The first three years in a day care preschool comprise the most important formative years for the little one. At KidTown USA, we have the best preschool program to teach children through fun games and activities. The educational games for preschoolers prioritize on meeting the highest social and emotional standards. 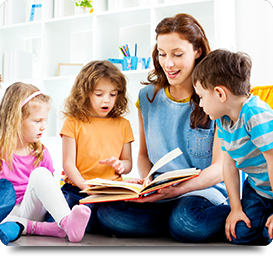 Experienced teachers handle the resources into providing the best preschool programs in Winter Springs,FL. We look into basic social aspects of preparing toddlers into blending fluently with the kindergarten school. We encourage nurturing self-help skills like taking care of personal things, putting their own coats on, and follow the best potty training manners. The preschool programs in Winter Springs and Oviedo,FL teaches children with basic education requirements appropriate with the age. The toddler care center of the KidTown USA teaches children in identifying basic alphabets and numbers. Children learn to recognize their first names, solve simple puzzles, and identify different colors and shapes rightly. The preschool curriculum program enables your tiny tot to explore the colorful world of crayons in expressing their innocent creativity. It is always a special experience for us to see a child’s face brightening up on drawing a pattern and coloring it with their tiny hands. Our core focus is on fostering the creative talents of your child through art. We believe strongly that the early introduction to art assists toddlers into growing to independent spirited human beings. The VPK preschool educational games help children to realize their natural artistic potential. We encourage the natural problem solving skills in children by interesting curriculum aspects. The after school programs for kids help them to express their feelings in the most constructive manner. We look into the progress of each child. Our instructors are always available in making the learning experience most comfortable with love and care.